Scuba diving in the Bahamas is one of the most time-honored, loved, and respected outdoor activities. Beneath the surface of the water lies a whole other world full of mystery and all kinds of curious creatures. With a PADI Open Water scuba certification, you will have the opportunity to explore the wondrous underwater worlds of the sea! And there is no better destination in which to get certified than the tropical islands of the Bahamas! The islands of the Bahamas are surrounded by endless excellent opportunities for scuba diving, both for beginner and advanced divers. With our Nassau Open Water Certification Course, you will go through all the required steps of completing your official PADI Open Water Certification. Here at Scuba Dive Bahamas, we set you up with only the most professional and experienced of PADI-certified dive instructors. Your coursework begins with a classroom session, where your instructor will teach you all you need to know about scuba diving. You will learn what a BCD is and what a regulator is, and what to do and not do while scuba diving. Throughout the presentation, you will complete small quizzes to make sure you are ingesting the material properly. The second part of the certification course takes place in our pool. Here, you will actually get to use your scuba diving gear, allowing you to get comfortable with the gear in a pool setting. After you have become comfortable using the different parts of your scuba gear, it is time to get in the water and learn how to actually scuba dive! The third part of the certification process is the “Check-Out Dives.” This is the part where you complete four different dives alongside your instructor. This is obviously the best part of the course, as you get to actually swim some 30, 40, sometimes even 50 feet beneath the surface of the water! Our check-out dives in Nassau take you to four different dive sites including wreck sites and coral reef sites. 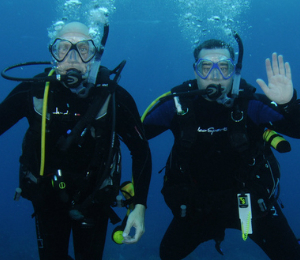 After you have completed all four check-out dives, you will officially be Open Water certified! You will receive your logbook and your certification card and you will now be able to dive up to 60 feet depths anywhere in the world! If you still have days left in Nassau, we will gladly take you on even more awesome scuba diving during your remaining time! Flying is not safe within 24 hours of your dives. Please plan accordingly to avoid a flight within the following 24 hours of your diving. I have been to the Bahamas many times, but Nassau PADI Open Water Certification is one of my favorite trips! It includes everything that everyone should do here. As a Bahamas veteran, I can say only the best about this experience!